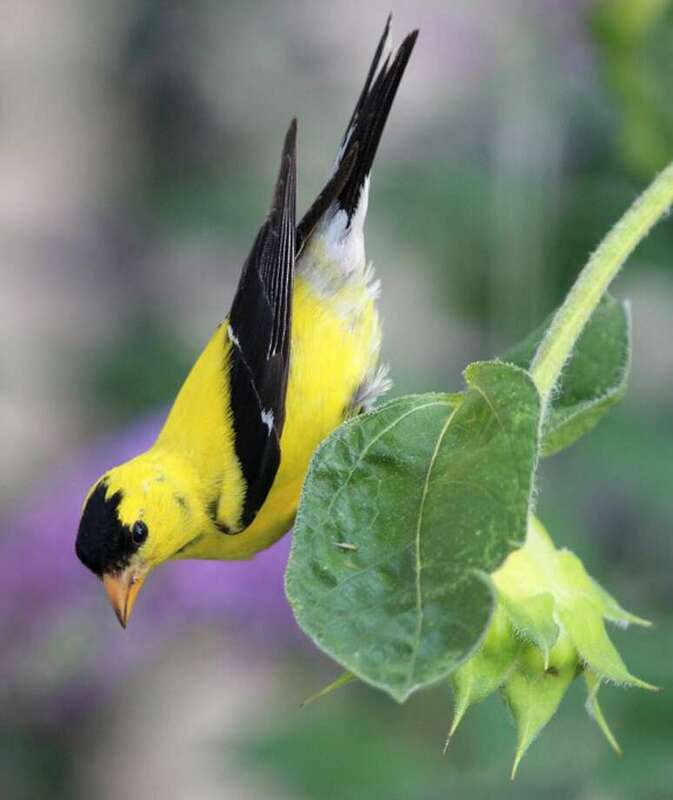 An American goldfinch eats seeds from a sunflower in New England. A large field grows next to the driveway of my son’s friend’s house. When I drop him off, I always look to the field to see if anything is happening. Usually I don’t see much; maybe a butterfly or dragonfly or two from a good distance. But lately the field has been alive with activity from a familiar bird with a familiar song. They are goldfinches and there are dozens of them in that field. Three or four pop up from the tall grasses and sing their “potato chip” song as they fly in their undulating pattern to another spot in the field. This happens about every 15 seconds. So why all the goldfinches lately? Most of the other birds that nest in New England are relatively quiet by the time August rolls around. The other birds are largely done with nesting and lay low as they raise their first-year broods. When the babies arrive, growing goldfinches have their pick of thistle, milkweed and other flowers going to seed. Nesting typically begins in late June or even into July — when most young birds of other species have already fledged or are getting ready to fledge. By the time young goldfinches fledge, their food sources are ready. Parents and young birds feed together, often visiting feeders in large numbers. Thistle silk is also used as a nesting material, of course — “the down of a thistle.” Many people think of thistle as a weed, but it’s an important plant for goldfinches — just like milkweed is vital for monarch butterflies. Not all weeds should be pulled, sprayed or otherwise eradicated. I have also heard that female goldfinches use spider silk to attach the nest to branches. It’s a smart adaptation as, now that I live in the woods, I am acutely aware of how strong spider silk is. Every other time I walk out the door leading to the deck, I get a face full of spiderweb. I’m surprised at how durable it is and difficult it is to shake off my fingers. Late summer can be a relatively slow time for birding. I’ve had luck attracting birds to my feeders — especially the hummingbird family — but walks in the woods have been pretty quiet. The rush of goldfinches this time of year is a welcome diversion as we gear up for the fall migration. By that time, the brilliantly yellow males will have started to transition in their drab winter plumage. Until then, keep your eyes on sunflowers, coneflowers, black-eyed Susans and other flowers. Chances are a goldfinch will eventually land on them for a quick meal.